Shelf space optimization, planogram software, salesroom and planogram modelling, planogram efficiency analysis, retail space use analysis, planogram supervisory control, monitoring of dependence of the margin on goods placement. The purpose of the system is to increase sales, optimize goods storage costs, and release blocked funds using the ABM Shelf merchandising service. ABM Shelf provides the opportunity to create new or download ready-made salesroom and trading equipment layouts from AutoCAD. Systems of this type do not need to be purchased, installed and supported, are continuously developing and compatible with any accounting or ERP system. Record and control of all operations of the salesroom merchandising process, reduced influence of the human factor. It is easy to upload equipment, outline a salesroom, place goods on the shelves, control facings, and it is convenient analytical data. ABM Shelf – an integrated merchandising management system in stores, which includes a wide range of functions and capabilities. Automation of the management of the layout and trading room with ABM Shelf allows you to model the store's store in 3D, analyze sales, control the layout. 3D modelling of various trading equipment types with regard to its dimensions (length, depth, height, etc.). Creation of multiple fixed-size trading equipment templates. Work with a stores database (a ready-made list). Convenient search and navigation. Creation of salesrooms models for shops (unlimited number). Placing of equipment templates in the salesroom (placing in an arbitrary place, equipment rotations, copying). Salesroom sales analysis (ABC analysis, sales analysis). Placing of additional objects in the store (columns, tables, chairs, point of sales, doors). Work with a ready-made stock list with regard to dimensions, prices, manufacturers, and balances from the record back-office system. Convenient goods search by item numbers or names with a possibility to apply balance, price, and range filters. Convenient placement of goods on shelves by casting goods (goods search for their place on the shelf themselves and automatically adjust their display depth). Import of item numbers by goods in the planogram, printing of planograms with placement of goods and goods placement chart. Simultaneous work with several shelves. Planogram changes history, 3D planogram modelling. 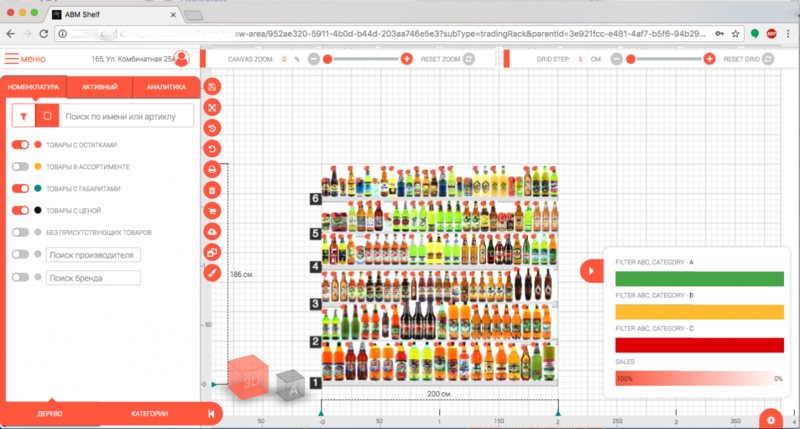 Convenient visual analytics on sales (ABC, net sales) and displays (by manufacturers, shelves, size, cost, or balances) with the possibility of exporting to Excel. Saving of an image into a file. Precise coordinate linear grid for work with equipment and stock lists. … and let’s make your stores even more effective together! The ABM Shelf merchandising service is a tool necessary for effective visual goods placement with the possibility of 3D designing of shelf planograms and salesrooms with regard to categorical management principles and range matrices. Goods merchandising as a complex of measures aimed at competent designing of stores becomes an effective tool to increase sales. The ABM Shelf merchandising system is intended to increase sales and the efficiency of use of every square meter of your trading space. You cannot do without promoting goods in retail sales and online merchandising. What merchandising data should be analysed? The objectives of the merchandising system include not only a goods display, which is limited to a planogram, but also visualization with a specific quantity and proportion of goods on a specific shelf. The ABM Shelf merchandising system allows you to visualize planograms, print them out to place goods according to the chart. Planograms are made on the basis of analytical data to boost sales with regard to the width and depth of the range. The buyer should be given the opportunity to find the goods he wants and have sufficient choice, on the one hand, and the buyer should not be confused by goods with the same characteristics, on the other hand. The objective of visual merchandising, i.e. optimization of dimensional profiles, is critical for fashion retail. The SaaS ABM Shelf merchandising service allows you to determine which goods, in which sizes and quantities should be presented in your store. The cloud service is particularly attractive due to the up-to-date and efficient nature of the approach – there is no need to buy licenses or maintain infrastructure.